The Oxford Gardens/St Quintins Conservation Area was designated in 1975, comparatively early in the history of conservation areas in the Borough. This happened partly in response to the threat to the area from proposals for a Channel Tunnel terminal, and partly because of an active residents group keen to protect this part of London. The Oxfords Gardens Conservation Area was extended in 2002 to include properties in additional streets. These included streets which were previously in Hammersmith & Fulham, prior to an adjustment of the borough boundary. A map of the Conservation Area boundary (thick green line) and the main features that lie within the SHRA/StQW neighbourhood, is below. Our streets are are within a conservation area because they were built as an unusually good and homogeneous example of Victorian and Edwardian housebuilding. The area does not include much by way of individual heritage buildings. This part of the St Quintin Estate was built from 1905 onwards. The building firm of E T Daley and A S Franklin signed an agreement with W H Quintin to build several hundred two storey red brick family houses. These were built on the streets now known as: Oxford Gardens (west of St Helens Gardens), Finstock Road, Wallingford Avenue, Balliol Road, Highlever Road, Kingsbridge Avene, Kelfield Gardens and St Quintin Avenue. The Oxford Gardens/St Quintins Conservation Area Proposals Statement can be found here. It was reviewed and updated in 1990. While this document is no longer treated by the Council as ‘policy’ it continues to be treated as ‘policy guidance’ by planning officers (and by the Planning Inspectorate when dealing with appeals). Where a property is in a conservation area, it does not mean that changes or alterations cannot be made. But there are tighter controls on what is allowed. In many cases these restrictions are applied via Article 4 Directions adopted by the Council. These Directions remove specified ‘Permitted Development’ rights that apply nationally, and mean that planning permission is needed for the types of works or development involved. Those works where planning restrictions are likely to apply, and/or where planning permission is required, include rear dormer windows for loft conversions, roof coverings (slates need to be replaced with slates, and tiles with tiles), roof-lights, and alterations to facades facing the street. Alterations to front boundary walls, installing bin or bike stores in front gardens, or paving over front gardens, also need planning permission unless they fall under national Permitted Development Rights which have not been removed via a Direction. So what alterations are allowed, and not allowed, within this neighbourhood can get complicated. House owners would be well advised the check the position carefully before undertaking works, particularly where these affect the appearance of the house from the street. You can contact the RBKC conservation team by calling 020 7361 3352. The Council has an active team working on planning enforcement, and will require property owners to carry out remedial works or to remove alterations where planning permission is needed but has not been obtained. This can prove an expensive business. The St Quintin and Woodlands Neighbourhood Plan includes a number of new and/or updated conservation policies which are now applied by RBKC when considering planning applications within the boundary of the StQW neighbourhood area (thin red line on map above). These policies were formulated and agreed via open meetings of the Forum during 2015, as the StQW Draft Plan was being prepared. In some cases they introduce variations to former RBKC policies. The aim has been to ensure that policies are consistent across the neighbourhood, and pay more heed to how house-owners wish to adapt and use their properties internally. For example, installation of rear dormer windows was not previously allowed in a number of streets in the area, under RBKC policies. This prevented some owners from creating a loftroom, a popular means of extending a home. Following the successful referendum on the StQW Neighbourhood Plan, a new StQW Policy C1 now applies, allowing rear dormers in all streets (excluding the ‘cottage’ properties where roofspace is insufficient for loftrooms, in the streets shown in orange as area 2 on the map above)..
You can check which Article 4 Directions apply in each street in the Borough via the list on the RBKC website at this link. The main ones affecting this conservation area are numbers 46, 62, and 63. Direction No 69 apply to providing or extending hard surfaces which front onto the highway (i.e. in front gardens). Not all of these Directions apply to all streets in the Conservation area, so it is complicated. The safest route is to check with the Council’s conservation staff on rthe number above. You can check whether your property is in the conservation area by entering the address at this link on the council’s website. RBKC recognises that many of the Conservation Area Proposal Statements date from the 1980s and need review. The Council has been introducing new Conservation Area Appraisals across its conservation areas. These documents set out the heritage value of each area, and the features seen as enhancing or harming the area in question. They do not set policies, but provide policy guidance when applications are being considered. The Conservation Area Appraisal for the Oxford Gardens are has yet to be published in draft form for public consultation. SHRA/STQW members will be alerted when it appears. The Council’s Local Plan policies in Conservation and Design were reviewed in 2014 and are now incorporated in the Renewing the Legacy chapter of the Borough’s Consolidated Local Plan. This document can be found via the Council’s website. 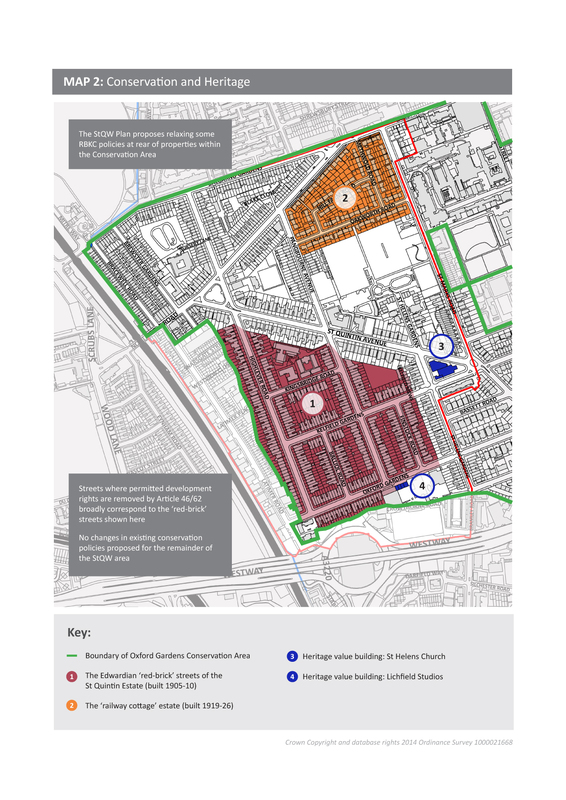 St Helens Residents Association routinely monitors all planning applications submitted in Dalgarno and St Helens wards. Under the 2016 Housing and Planning Act, the Council now has a statutory duty to notify any neighbourhood forum of applications within a designated neighbourhood area. Where applications depart from either RBKC approved policies and Article 4 directions, or from the Oxford Gardens/St Quintins Conservation Area Proposals Statement, the Association will normally point this out to the council and ask for the application to be refused. Where we think the policies or Directions are being incorrectly applied, or the new StQW conservation policies are being ignored, we are likely to write in to support an application in such circumstances. While we have no wish to interfere unnecessarily with the plans of individual property owners, the association does want to ensure that conservation policies continue to be enforced on this part of the St Quintin Estate, for the collective benefit of all residents and visitors to the area. This is not just an issue about protecting the heritage of the neighbourhood. It is also about protecting house values. A study undertaken by the London School of Economics (2012 LSE study) shows that in conservation areas classified as being ‘at risk’, the premium on house values drops on average from 9% to 4%. Areas ‘at risk’ are those where planning policies (e.g. resisting installation of front rooflights) become widely ignored by property owners and where no enforcement action is taken.